This is my fantasy world where fairytales live. Airbrushed in Adobe Photoshop 7.0. Finished it in one day, ~ 12 hours. I REALLY CAN T BELIEVE IT!! IT S GREAT!!!!!! i wish i was there. very nice work. i like that you put so much details in your pictures. the little skull at the right on the bridge is cool. the sky in the backgroud ... i ve forgot to breath. all i cna say really is WOW! that is so amazing. i totally wish i could do stuff that well. this IS the best pic i ve yet to see. kudos to you man. 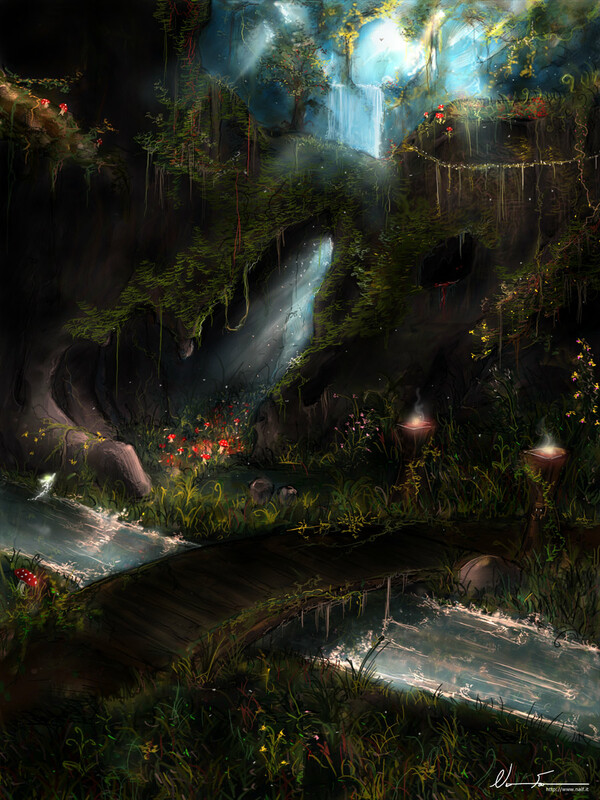 and this picture seems very nice i wish i could paint like this and i wish i could live here with a beautiful girl. Helt underbar, du är otroligt duktig. Riktigt fräsch! Den gillar jag skarpt! / Really cool! I like it alot!!! I don t know how you can do that on the computer. Amazing. It is a perfect picture. At once it is visible, that the artist has tried. Your creativity is necessary for many people. A thank from me and my friends. you drew.... for 12 hours straight? do you have a life outside of drawing or are you a professional artist? Den e riktigt snygg niklas ! ;D Vi måste ta en match på CS snart me ! CyA! WOW!!! You are a God! Can t find the right words to decribe it s beauty. Dear god was the first thing that poped into my head. Truly amazing. The only thing I noticed was the mushrooms far up to the right and left. I get the feeling that they stand out to much from the rest of the upper landscape. Almost getting this pasted feeling. WOW.. what a deep in the picture! Really love the light effect! Now, I know you put your signature in the stream somewhere so...where is it?! You dont know me but it looks really really good! I wish I could do that in photoshop! I need more tutorials like the one you offer here. Thanks! You re crazy :) One of the best "digital artists" I know. Keep it up man. Very nice. A bit dark for my tastes but still a great digital painting. Impressive lighting effects. Gorgeous! I wish I lived there. This painting has been viewed 18198 times.